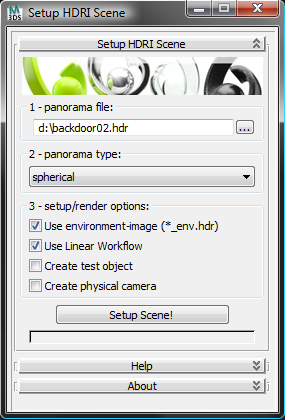 step 1: select the HDRI to render. step 2: select spherical or hemispherical type. step 3: choose setup/render options. step 4: create scene setup. Submitted by 48design on Wed, 2011-10-05 03:22.
you can simply use the contact form from the support-link in the footer of zwischendrin.com. Submitted by Graph on Sat, 2011-10-01 22:36. Nice addition to what you offer on your site.. I've got a proposal for you but couldn't find a method of contacting you, would you mind shooting me a mail?